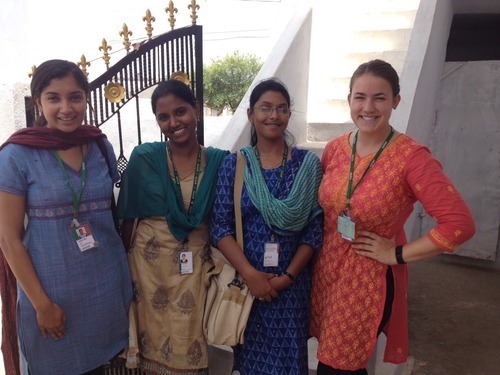 TCi intern Katy Merkel (pictured right, with fellow TCi intern Amrita Rao, left, and two ICRISAT field investigators) reflects on her first two weeks in the field where she and four other interns, in addition to TCi staffers, are hard at work pilot testing the dietary diversity module of the Minimum Nutrition Dataset for Agriculture (MNDA). Read more about TCi’s work in creating a minimum set of nutrition metrics for use in agriculture surveys here. Since our arrival in India, the TCi intern team has taken great strides in the development of the dietary diversity module of the Minimum Nutrition Dataset for Agriculture, or MDNA. We are here to pilot test this module with between 120-140 women in rural areas of Maharashtra and Andhra Pradesh. But first we need to pre-test and finalize our survey instrument. We spent our first week-and-a-half reviewing and discussing the survey instruments, becoming familiar with the underlying theory and principles, and editing the instruments as a team with our partner organization, ICRISAT. This past week, we got to put these instruments to the test in some preliminary rounds of interviews, as well as conduct a focus group meeting. The goal was to help us identify the positive and effective aspects of the surveys, as well as identify areas that needed tweaking in order to be most useful for our purposes, and for broad applicability in other places and contexts. This universal applicability concept has been one of the most challenging to integrate into our work. As a Masters student in International Development at Cornell, I often study projects that are highly contextual and oriented to specific regions and cultures. While this can be extremely beneficial, the goal of the MDNA is to be adaptable, flexible and broad enough that it can be applied to many different contexts, allowing for the largest benefit in the effort to link agriculture and nutrition. We are hoping that by using this pilot, we will be able to achieve a set of instruments that are effective in collecting essential dietary diversity information not only in Andhra Pradesh and Maharashtra, but also across India, Sub-Saharan Africa, and other agriculturally developing regions of the world. On Wednesday, we traveled to a village in Andhra Pradesh located about an hour away from the ICRISAT campus. In this ‘mini pilot’ we broke into groups which consisted of members of the TCi team and ICRISAT investigators and staff. We used our edited survey and questioned women to uncover what they had eaten over the past three days. Dietary recall is not straightforward—trying to recall out of the blue what you had for lunch two days ago is difficult. However, the women were able to provide us with much information and they seemed excited to participate in the survey. In fact, the whole village was interested in our presence; several times the doorways to the houses we were in would become crowded with onlookers intrigued as to what we were up to. We returned back to the ICRISAT campus feeling rather sticky and tired, but satisfied with how the day had gone. We were able to discuss our individual experiences working with the survey device and communication matters with our enumerators, dealt with other small issues that arose throughout the day, and translated them into useful revisions in the survey. These changes ranged from modifying page layouts, to rephrasing questions, to clarifying the purpose of specific sections. We are now feeling much more confident in using this survey device in the field when we conduct the piloting of the MNDA dietary diversity study. The second big event of the week was a preliminary run of a focus group discussion (FGD). This was conducted in a different village, also about an hour away. We had a really great turnout, with approximately seven women and ten men (plus two adorable toddlers) at the start, with some other villagers trickling in later. We had the help of two ICRISAT staff members who have been incredibly helpful throughout our time here. The goal of the FGD was to see if the conversation starters we had identified would guide the discussion towards the information we wished to find out: what food do people normally eat, where do they get it from, and how much variation should we expect to see from seasonality and amongst those of different caste and class. Again, given this experience, we were able to make a few changes in the way we plan to conduct and record the FGDs in the future when using the MNDA. The biggest obstacle we see here is the language barrier. During this preliminary run, the moderator was a native speaker of Telugu, and could easily communicate with the FGD participants. He was sensitive to cultural issues, aware of the participants’ modes of thinking, and could easily probe participants who were remaining quiet, such as the younger women who were hesitant to contribute to the conversation. Unfortunately, we ourselves possess none of these skills. Like other survey instruments, the MNDA will always require that implementers and partner organizations have or find individuals with this skillset. For our upcoming pilot, we already know that our translators, the ICRISAT field staff who live and work in the villages we will be surveying, will be utterly invaluable in helping us conduct the full pilot. We will have to work hard to establish a rapport with them, and identify the communication needs of both parties in order to have a successful working relationship. I am really looking forward to this process. On Monday, we will take these into the field and begin our pilot testing of the MNDA dietary diversity survey. I speak for us all when I say we are anticipating this experience with excitement and determination to collect good data, feeling a little nervous but well-prepared for the work that lies ahead.